May 13, 2018, during a meetup hosted at Google NYC, Primas discussed their vision to use Blockchain technology to change the way people engage with online content. They proclaimed this was their way of restoring health back to the Internet. 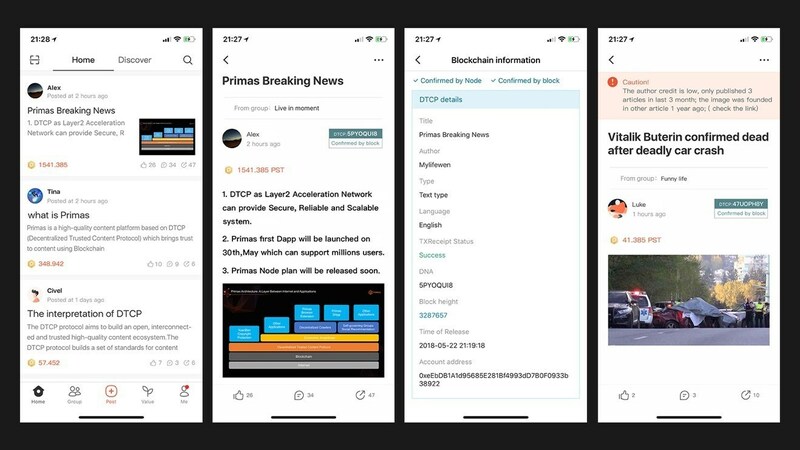 "The core of Primas", introduced by Gan Lu, co-founder of Primas, "lies in a middle layer built between the Internet and applications. We call it the DTCP or Decentralized Trusted Content Protocol. This middle layer records the metadata of content onto Blockchain, making it tamper-proof and traceable. Later, this immutable metadata could be searched by Internet applications and provided as evidence for a variety of use cases". Gan Lu provided Vitalik's case as an example to show how immutable metadata could be used against fake news. "If the DTCP includes the author credit and posting time, when you see the article, there would be an alert message showing that the author's credibility could be in doubt due to the fact it was only the author's third article without a sound reputation. Additionally the photo used in this article would have been flagged for previously being published over a year earlier and not matched with the claimed time stamp. By providing this credit score and warning, it allows the reader to first process the reliability of the news before engaging in sharing, commenting or liking it. The DTCP creates a credibility system for content and authors. This, Primas believes is the key to solving the fake news epidemic. Provided as open Internet infrastructure, all Internet applications could be built upon the DTCP, providing not only a solution for fake news but as basis of how trust can be instilled across many aspects and platforms across the internet. Gan Lu introduced the Primas DApp (Decentralized App), which stands against the click economy, identified as the main cause for low-quality content economics that plagues the internet today. "The only purpose of content is to gain as much traffic as possible. Todays content model is based on high traffic sustainability to provide revenue through side advertisements, as an author this is their revenue model and the content is only a plug." In the Primas DApp, authors will receive direct payment from the system through a token incentivization model. The amount one can earn depends on the evaluation of the content based on peer engagement and author's credit. Users in return, receive high quality content through peer and social recommendation. In addition, content consumers will also be rewarded by spreading and interacting with the premium quality content. "It might be the first DApp that could be massively adopted by millions on the Blockchain. There's always a tradeoff between security and scalability. That's why Blockchain itself could never be fast. We have built an acceleration layer upon Ethereum to off-load unnecessary operations, letting Blockchain focus on only the token and governance. The acceleration layer enables our system to scale and support infinite number of users. The Primas DApp has already been released on the iOS App Store, search for "Primas" and try it for yourself". In closing, Lu reiterated "When the DCTP records metadata for one piece of content, a unique identifier called 'DNA' is generated. It is our mission to generate DNA for every piece of information on the Internet. It will be a brand-new way for information to be identified and inter-linked together. With Primas infrastructure, we can create a new Internet environment where people can trust and freely share high-quality content with each other, while taking responsibility to build a better Internet".